Sorry Foreign Film Friday is coming on Saturday but yesterday was crazy, but in a fun way 🙂 Now onto the fun !!!! 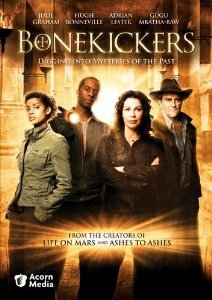 Last week hubby and I watched the BBC series Bonekickers, a show about a university archeology team causing havoc, solving mysteries, and getting into trouble in England. I loved the characters, although the team leader Gillian Magwilde, played by Juile Grahm, does lean a bit too much on the bitchy side sometimes. It is consistent with her character, though, and you get enough back story to understand why. Gregory Parton, played by Hugh Bonneville, and Ben Erga, Adrian Lester (love him), balance Gillian and add humor to the story. Now two things, first this is only a single-season show. The plot arc is wrapped up by the end, so I think it was only meant to be one season. And second, you shall have to give some creative license for the archeology. Archeology takes time, patience, and a lot of tests, which this show just doesn’t have time for. So if you can’t hush your inner critic, which I had difficulty doing a few times, this might not be the show for you. BUT, I loved the history, the stories, the mystery, and the characters. I think you should check it out. Thank you for finding this! We’ll be watching for sure. Is it on Netflix streaming?